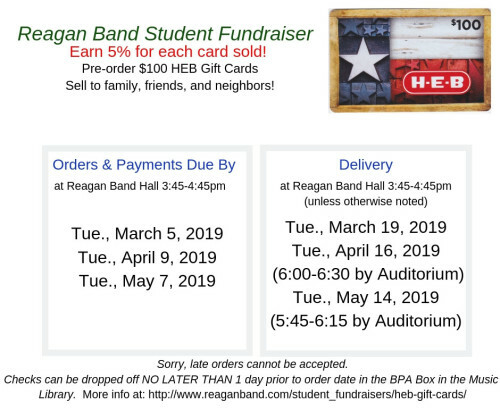 This is a MONTHLY (including during the summer) gift card fundraiser in which students can earn 5%for sales in their Charms accounts to spend on band fees or trip fees. Physical gift cards are only sold in $100 increments. Payment must be rendered prior to cards being ordered. We prefer checks, but can also accept cash if delivered in person. SORRY, LATE ORDERS CANNOT BE ACCEPTED. If you cannot make it to see us on the order day, please submit payment to the BPA locked box (top drawer with slot in filing cabinet) in the music library. Submission here must occur no later than the day BEFORE the order date. There have been times folks missed out on orders because they or their child placed the order in the BPA box the day of the order. Don’t let that be you. If you or your child have missed the order date, there will be another opportunity next month. See Schedule in graphic below. Everyone buys groceries so you can sell to neighbors, family, friends, and Reagan Band Alumni parents who shop at HEB. They can make the checks out to you or out to RRHS BPA. 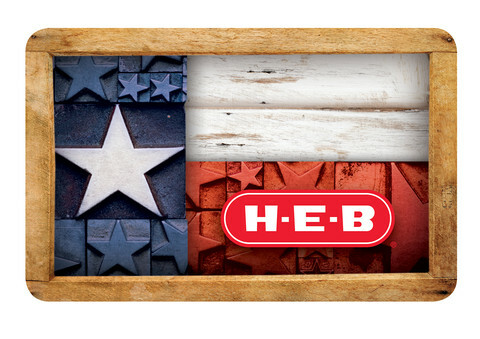 Please check the band calendar as HEB dates do change sometimes. We plan dates months in advance and try to limit changes. The band calendar will always have the most accurate dates as we close in on HEB dates. Cash is only accepted in person. Cash CANNOT accepted via BPA Box. Please do not combine HEB, Wash Tub, or Krispy Kreme orders on one check. A separate check must be made out for each fundraiser. We sell Wash Tub and Krispy Kreme gift cards when we receive funds or disperse HEB cards. Not able to use for Curbside at this time, but HEB is working toward being able to use gift cards for this.